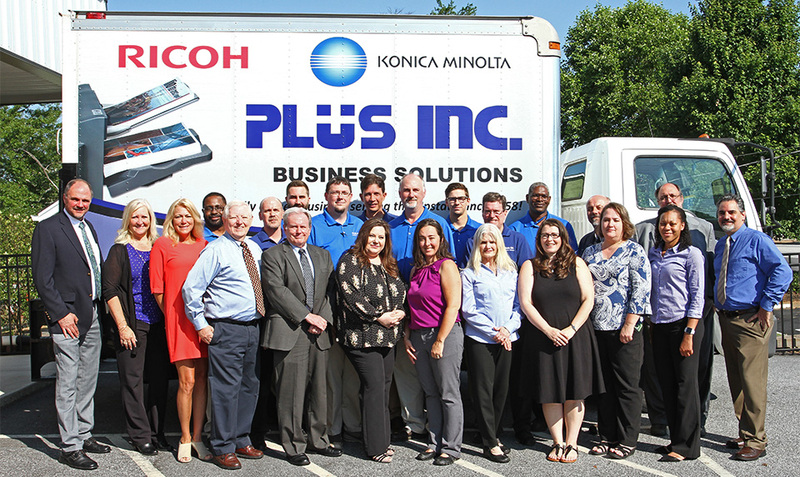 From printers and copiers to IT solutions, Plus, Inc. is your all-in-one solution. Bringing small businesses in the Upstate unparalleled expertise from a dedicated, local team. The setup of your business, from the office printer to your IT network security, is crucial to your success. You need a partner you can rely on, and Plus, Inc. has been that partner for small businesses throughout the Upstate for over 60 years. With complete office solutions, our experienced team is here to help you assess your current setup, improve your workflow efficiency, organize your document management system, and keep you secure. Learn More About Plus Inc. NEED A NEW PRINTER BUT NOT SURE WHERE TO START? The Plus, Inc. team is here for you. And that means helping you get the right device for your needs. Knowing the nuances of each printer or between each manufacturer is what we do. All you have to do is tell us what you need to use it for and some basics about your office setup. I can not say enough about the team of professionals at Plus Inc! The sales team, tech team and maintenance team are all above and beyond what a company could hope for when buying/leasing new machines for their business needs. We have 4 machines through them and are so completely happy with every element or our interactions with Plus Inc. It is so nice to see an entire group of people pulling together to make a company perform successfully. HIGHLY RECOMMEND! I came to work for the Jervey Eye Group in 2010. At that time Plus Inc was the select partner for Printer, Fax and Copiers sales and service. The relationship between the mutual companies was evident. I don’t recall when the partnership started maybe 5, 10 years before that. They remain our choice vendor at this time because they are competitive with their prices, prompt with service and professional with their support. I believe they earn our business each and every time we work together. Thank you for your support, sales and service. Keep up the great work! Great company. Always responsive to our business needs even when we have a lot of restrictions. I would highly recommend Plus Inc to any business. Southern First Bank is now 19 years old and Plus Inc. has been our partner for the entire journey. We have consulted with them on every new office and their advice and expertise has been invaluable. We deeply appreciate our long standing relationship with Plus!